The Days of Johann, an agility dog! 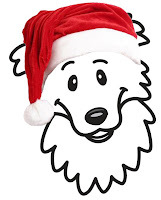 : Day 9 Johann's Howling Howliday Giveaway! Day 9 Johann's Howling Howliday Giveaway! Happy Monday everyone!!!! Hope you are staying warm and dry! It's Day 9 and we have even more cool prizes to give away today and today marks the half way point! 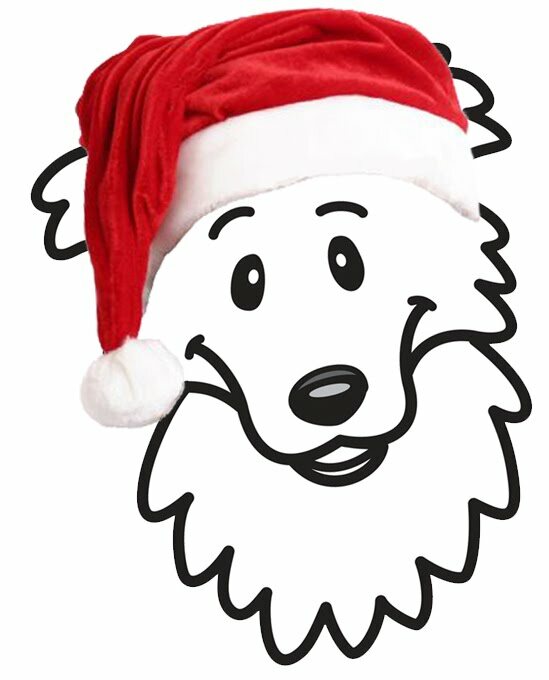 Today is the ninth day of Johann's Annual Howling Howliday Giveaway! Don't furget, there are lots more chances to win, we're just at the half way point. So check back, 'cause we'll be giving away something every weekday thru December 24th! And don't furget, our designated charity could really use your help, click here to give a little donation, whatever you can spare! I'd love if we could reach $500. Remember even a buck will do...imagine if everyone who reads my blog donated a buck, we would reach our goal in no time! And that's less than a cup of coffee to help save the life of some pups! On with the prizes....we have three, count 'em three, contributors today who have donated some pawsome prizes for our winner. You know how I like to be a dog, get dirty, get burr-ey, get muddy. Well the folks at Dublin Dog think just like my Mum, it's just a part of being a dog with a great life! Dublin Dog is famous for their all-style-no-stink collars. They think it's a dog's inalienable right to get out and get dirty. Especially those big rascals who'll run through mud to bring you half an oak tree. Style-No-Stink dog collar, which even Paul Bunyan's dog couldn't wear out. And it's great for you too, since it looks fantastic, rinses clean in seconds and won't harbor odor-releasing bacteria. They have graciously contributed a cool Dublin Dog Collar, Leash and T-shirt for your human to today's lucky winner. Just one more reason your best friend should be a Dublin dog! Our next contributor is Earth Heart! Earth Heart™ Inc. has a long-standing reputation for providing quality wellness products using pure essential oils and other plant-based ingredients. They are donating a bottle of Canine Calm Aromatherapy Mist (2oz) to one lucky dog, just in time for the Holiday stress! With their Canine Calm, Earth Heart has been calming dogs for 10 years. Their Canine Calm is made with pure essential oils and is soothing during thunderstorms, fireworks, competitions, adoptions, holiday travel, bath time, clinic or kennel visits, and other unsettling times. Oh, did I just say competitions? Hmmm...may have to try this out with Gracie! If you order today, from Earth Heart you'll get a free Guard Well Mist with your order if you enter "Johann" in the special instructions during checkout! And our third contributor today is Island Time and they are graciously donating a 100% Natural Large Dog 2-Bites Dog Chew. Island Time Pet Toys and Accessories are created in the USA using a combination of hand-made traditional nautical rope methods and only the finest quality 100%-cotton, American-made, non-toxic rope. And you know how much we love the green, safe stuff! 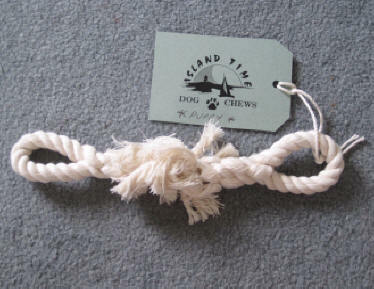 Their Large Dog 2-Bites Dog Chew is a fun natural toy made with a traditional nautical eye splice on each end. This bone shaped rope toy is approximately 14” long and each splice is hand sewn in place. 1. If you're on FB, go to Dublin Dog's Facebook page and 'like' them. 2. If you're on Twitter, add Dublin Dog as a friend. 3. If you're on FB, go to Earth Heart's Facebook Page and 'like' them. 4. This one's is a scavenger hunt clue! Go to Island Time Pet Products website tell me the name of the dog who inspired Island Time Pet Toys. You need to hunt around their website to find the answer :). Bwwwaaahahahah! That's it, now go get started...you have until 11:59 PM ET tonight (December 13, 2010)! For all the fine print rules, click here. Contest is open to all US residents, 18 years or older in the 48 contiguous US states. Apologies to our friends North and South and across the pond. EDIT: We have a winner! Sara is the winner of Day 9 of Johann's Howliday Giveaway! Congratulations Sara! Liking and following = done! We liked Dublin Dogs, and Earth Heart. Hope we will the calming spray! Is the dogs nameCeilidh, a yellow lab? Hi there, I have liked everything and the name of the dog who inspired is Ceilidh.